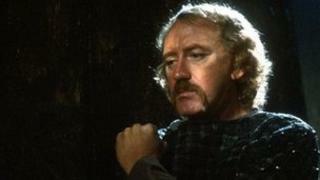 Scottish actor Nicol Williamson, best known for his role as the wizard Merlin in the 1981 film Excalibur, has died aged 75, his family has announced. The actor passed away of oesophageal cancer shortly before Christmas in Amsterdam, where he lived. A much respected stage actor, he was nominated for his first Tony Award in 1966 for Inadmissible Evidence. Playwright John Osborne once called him "the greatest actor since Marlon Brando." Williamson was nominated for his second Tony Award in 1974, for his role in Anton Chekhov's Uncle Vanya. He won a Drama Desk award the same year for the role. Born in Hamilton, South Lanarkshire, he attended the Birmingham School of Speech and Drama. He made his professional stage debut at the Dundee Repertory Theatre in 1960, before appearing in Tony Richardson's production of A Midsummer Night's Dream at the Royal Court Theatre. He later teamed up with Richardson again, to star his Hamlet production at the Roundhouse. It was so successful, it transferred to Broadway and was adapted into a film, which co-starred Anthony Hopkins and Marianne Faithfull. In a statement on the actor's website, his son Luke Williamson said: "It's with great sadness, and yet with a heart full of pride and love for a man who was a tremendous father, friend, actor, poet, writer and singer, that I must bring news of Nicol's passing." He went on to say that his father passed away "peacefully". "He gave it all he had: never gave up, never complained, maintained his wicked sense of humour to the end. His last words were 'I love you'. I was with him, he was not alone, he was not in pain." The actor's son Luke Williamson, said his father was also survived by his wife, Jill Townsend.